Salumificio Pedrazzoli is back at SANA, The Salone Internazionale del Biologico e del Naturale, this year at his 30th anniversary. Appointment is at Fiera di Bologna from Friday 7th September to Monday 10th September inside NaturaSì area, main distributor of the excellences of Italian organic sector. 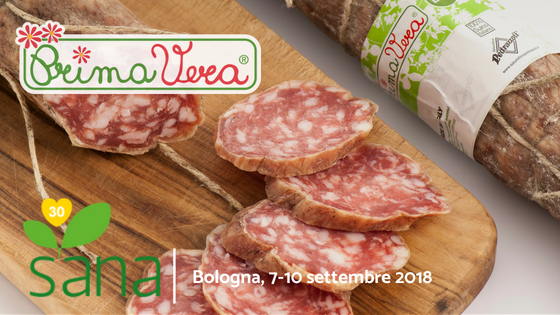 Our company will take part into the event in Bologna with the products of the organic line PrimaVera Bio, among which there is Ettore, organic salami produced according to the original Felino recipe and named after one of the first customers who believed in our organic project. During SANA we will introduce the new iconic limited edition packaging for Christmas 2018, along with other ideas for Christmas and New Year’s Eve. Another great novelty for this year edition is going to be the collaboration with Associazione Panificatori Bologna who is going to build a real fresh pasta laboratory in its area. Team Le Sfogline is going to prepare tortellini during SANA days, and they will be filled with our Prosciutto di Parma PrimaVera Bio! We look forward to meeting you at SANA 2018 at NaturaSì area, pavilion number 22. Salumificio Pedrazzoli and PrimaVera Bio are going to be at stand A/1-C/51, we look forward to welcome you for a degustation of our organic charcuterie and to let you take you a closer look at the passion we put into creation of high quality products!